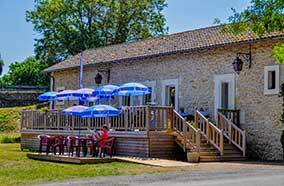 Our campsite in Dordogne offers you entertainment and activities for all ages during the summer season. 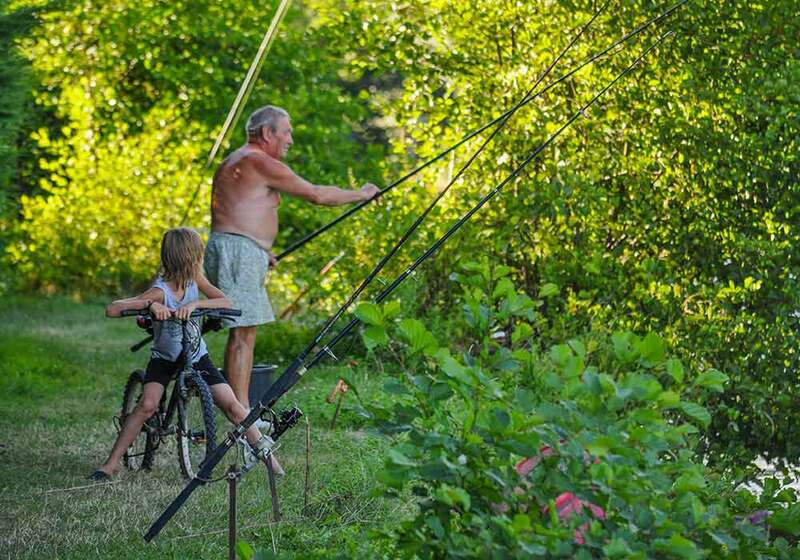 However, the campsite remains a tranquil place, since we strive to maintain a relaxing atmosphere. That is why each activity is only on offer a few days per week. 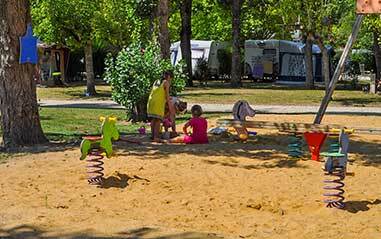 At our small family campsite, your kids will soon find their independence and meet new friends. Children between the ages of six and twelve enjoy two hours of morning activities three times per week. The playground is the favourite place for kids to play. Benches are installed nearby for the grown-ups accompanying them. Children will thrill to the double swing, sandbox and three spring toys, including a teeter-totter. New in 2018, the trampoline will be their meeting place with the new friends they’ll meet during their holiday in Dordogne. During the summer months, we offer a variety of forms of entertainment during the day and evening. The watchword is conviviality. 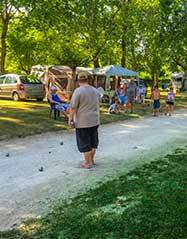 Become the campsite champion of the Périgord at a pétanque tournament. 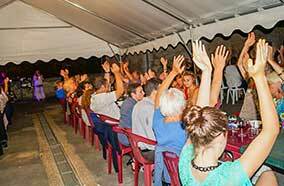 Fun and laughter are guaranteed at the bingo and music quiz nights. Every Wednesday evening, we coordinate a theme dinner, and we are counting on you to get the dance floor rocking at our disco nights or to take the stage during karaoke nights. Once a week in July and August, you are free to try the swimming pool “by night” and to swim through the coloured lights of the pool until 10:30 p.m.
To stay in shape in the most delightful way and learn more about the Périgord, you might join the group hike departing from the tourist office of Montpon every Tuesday morning. Chandos, located three minutes’ walk from the campsite, is a fully-equipped leisure area on the riverbank and an ideal place to enjoy a stroll. 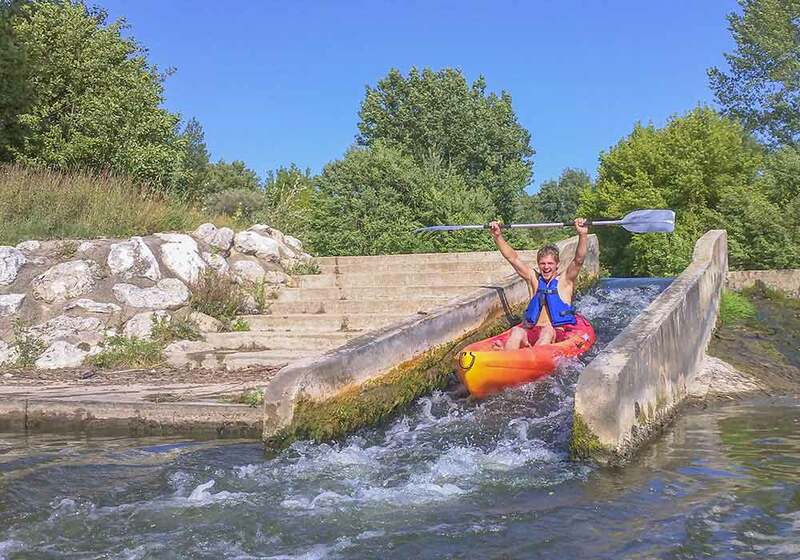 It also includes a playground, a swimming area supervised by a lifeguard in July and August, and paddle boat and canoe rentals. Near the campsite is the Grand étang de La Jemaye, a large pond at the heart of the La Double forest, where you may swim or hike along well-marked paths. Or relax on the sandy beach of Gurson Lake at the edge of the pine forest. After a day filled with activities, you’ll enjoy relaxing at the pool. The swimming pool area is designed for all ages, so take the plunge!